I made up this recipe last night on the spot with the leftovers in my fridge. To add a little pizzazz, I pulled out my George Foreman grill and put a little char on the vegetables! Yep, I went there! You can add anything you want to this like corn, peas, chicken, peppers etc. just whatever you have in your fridge. Slice the zucchini, squash and onion into thick slices and place on a olive oiled grill (high heat). Cover and after 3-4 minutes, flip the veggies. In a pan saute mushrooms, carrots, and remaining onion in olive oil and vinegar. Once the grilled veggies are done, cut into bite sized pieces and throw into the pot with carrots and mushrooms, Add 4-5 cups of water along with all of the spices and beans. Bring to a boil then let simmer for 10-20 minutes. Serve with a dollop of plain greek yogurt. Yum, I decided to try something new for breakfast this morning and ended up falling in love with the outcome! I made protein pancakes topped with a blueberry compote. Served them to my friend and dad, who loved them just as much as I did! They requested to have them tomorrow morning too! Make as you would normal pancakes on a medium heated skillet. Serve with blueberry compote and 2 tbsp. pure maple syrup. In saucepan, heat the blueberries on medium heat until they turn into a compote consistency. If you would like more sweetness, add some stevia or honey. I made burgers for Independence day. Beef for the boys and turkey for me. Surprisingly, the boys preferred the turkey burgers over the beef because they said the seasoning stood out tons more with the turkey burgers (which really surprised me because I doubled the seasoning for the beef burgers). Here is the recipe that I came up with. Combine all ingredients with hands in a bowl (be careful not to over mix or else you will get tough burgers). Form into small burgers (6-8). Place on a baking sheet, cover with plastic wrap, and refrigerate for at least 2 hours. When ready to grill, place on a preheated (high) grill covered. Flip when the burgers detach themselves from the grill without struggle(5-6 minutes). Let finish on the other side for about 3-4 minutes. Use the butter lettuce for buns and build your burger with guacamole, tomato, onion, and mustard. I am sure many of y’all are planning an awesome cookout or camping trip to celebrate our country’s freedom! 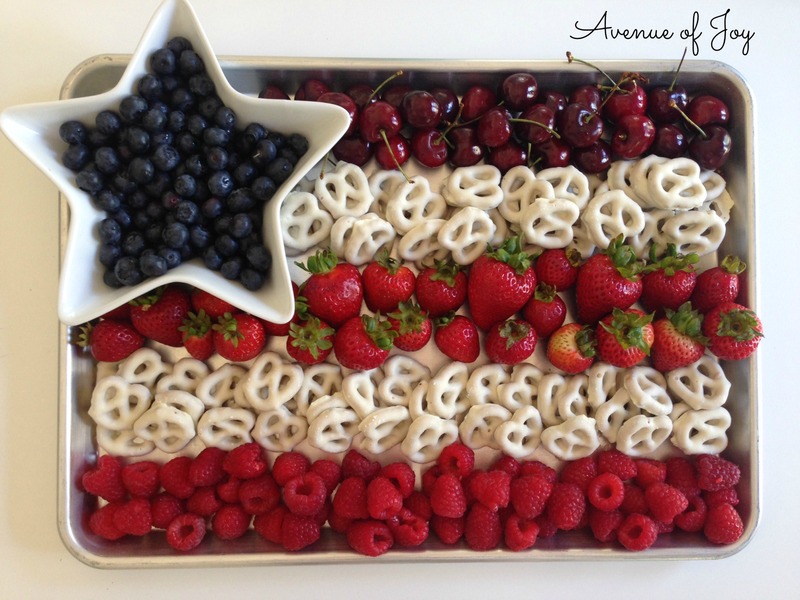 I have put together a few sweet treat ideas for your celebrations! From fruit trays to clever smores, I hope you try them out! Cut strawberries and bananas into pieces and assemble on skewers like the picture above. If you are wanting to snazz up that fruit tray, substitute yogurt covered pretzels with the bananas. Combine the yogurt and protein powder. Dip pretzels in the yogurt mixture and place of a waxed paper cooking sheet. Once all of the mixture is used, freeze pretzels until hardened. I don’t know about y’all, but when 4th of july comes around I am craving a good ole s’more! Nothing is wrong with treating yourself to a regular s’more, If you are willing to skip the marshmallow, there is another alternative that is just as good and fun to hold over a fire! Bananas!! Simply cut the banana into a marshmallow size for the s’more. Hold over a fire to allow the banana to caramelize. Place between gluten free graham crackers and 70% dark chocolate and voila! Now if you cannot bypass the marshmallow but are willing to spend a little time in the kitchen to make a healthier treat, here is a recipe that is equally as good allowing you to eat more with less guilt…Yay! Pour ½ cup of water into the metal bowl and whisk in the gelatin. Let sit. Pour the other ½ cup of water and the 1 cup of honey into the small saucepan. Bring to a boil and stir for 8 minutes. Mix on medium as the honey mixture is added. Grease a 9×13 inch baking dish with coconut oil, or line with parchment paper, leaving some on the sides to be able to pull up. Pour whipped marshmallow mixture into the lined/greased dish and smooth evenly. 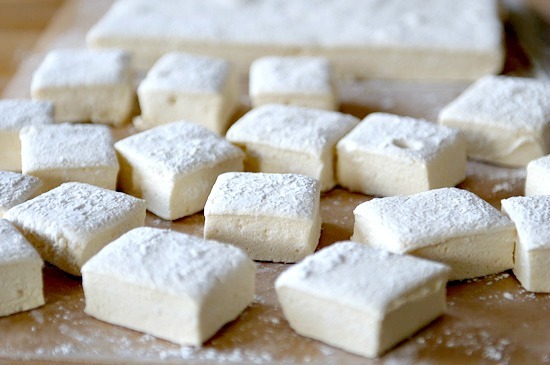 Assemble the s’more by using gluten free graham crackers, 70% or higher dark chocolate and these healthy marshmallows!